1. This circular is being issued in continuation to SEBI circular no. CIR/OIAE/1/2014 dated 18th December, 2014 regarding redressal of investor grievances through SEBI Complaints Redress System (SCORES) platform. 2. SCORES is a web based centralized system to capture investor complaints against listed companies and registered intermediaries and is available 24×7. It was introduced on June 8, 2011 and has been facilitating redressal of investor grievances in a speedy manner. 3. SEBI encourages investors to lodge complaints through electronic mode in SCORES. However, complaints received from investors in physical form are also digitized by SEBI and uploaded in SCORES. Thereafter, follow-up actions of the complaint are done in electronic form only i.e. through SCORES. Investors can easily access, retrieve and preserve the complaints lodged by them in electronic mode. Further, it enhances the turnaround time and speed of redressal of a complaint. 4. Investors may contact the Investor Associations (IAs) recognized by SEBI for any assistance in filing complaints on SCORES. The lists of Investor Associations are available on SEBI website (www.sebi.gov.in). Investors may also seek assistance in filing complaints on SCORES from SEBIs toll free helpline number 1800 266 7575 or 1800 22 7575.
ii. Complaints those are sub-judice i.e. relating to cases which are under consideration by court of law, quasi-judicial proceedings etc. iii. Complaints falling under the purview of other regulatory bodies viz. RBI, IRDAI, PFRDA, CCI, etc., or under the purview of other ministries viz., MCA, etc. iv. Complaints against a sick company or a company where a moratorium order is passed in winding up / insolvency proceedings. v. Complaints against the companies where the name of company is struck off from RoC or a vanishing company as per list published by MCA. vi. Suspended companies, companies under liquidation / BIFR / etc. a. Investors who wish to lodge a complaint on SCORES are requested to register themselves on www.scores.gov.in by clicking on Register here”. While filing the registration form, details like Name of the investor, PAN, Contact details, Email id, Aadhaar card number(optional), CKYC ID(optional) etc. (Annexure A) may be provided for effective communication and speedy redressal of the grievances. Upon successful registration, a unique user id and a password shall be communicated to the investor through an acknowledgement email / SMS. b. 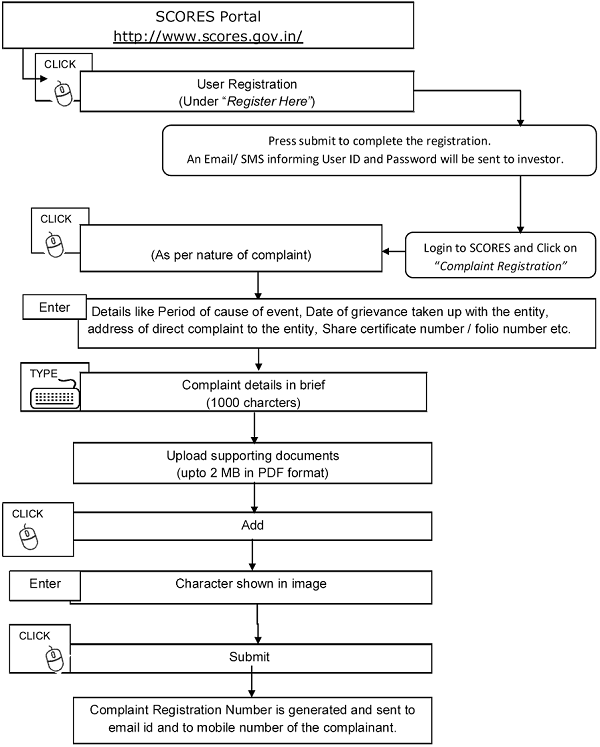 An investor shall use login credentials for lodging complaint on SCORES (“Login for registered user” section). Details on how to lodge a complaint on SCORES is at Annexure B. The complainant is not satisfied with the reply given to him or redressal action taken by the listed company or an intermediary. 9. Stock Exchanges, Depositories and the Association of Mutual Funds of India (AMFI) are accordingly advised to bring the provisions of this Circular to the notice of all Listed Companies, registered Stock-Brokers, Depository Participants and Asset Management Companies respectively and also to disseminate the same on their websites. Further, Stock Exchanges, Depositories and AMFI should also arrange for adequate publicity of this Circular on an urgent basis. 10. This Circular is issued in exercise of powers conferred under Section 11(1) of the Securities and Exchange Board of India Act, 1992 to protect the interests of investors in securities and to promote the development of, and to regulate the securities market. 11. This Circular is available on SEBI website at www.sebi.gov.in under the category “Legal /Circulars”. viii. Email id* – For receipt of acknowledgement letter / updates of complaints on SCORES. ix. Bank account details – To facilitate direct credit of benefits to investor. x. Client id as given by Broker / Stock Exchange. Note: * are mandatory fields. How to lodge a complaint on SCORES with effect from August 01, 2018.